From PhD-level chats (over coffee, lots of coffee) about the fit of boyfriend vs. skinny jeans to office-wide #twinning in our own Stitch Fix faves, we’re a pretty unique company. From expanding our ever-growing family to opening more warehouses (to better ship to you! ), we could barely keep this short. 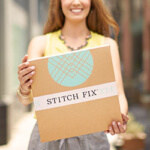 Here are 10 things about Stitch Fix that you might not have guessed about us! Really—we’ve never shipped out two identical Fixes! Proof that our Stylists hand-select pieces personalized to your specific needs. Stitch Fix employees celebrate when their Fixes get delivered to the office. We have un-boxing parties too, and they usually involve impromptu fashion shows. Having a fashion dilemma? Not sure what to wear with your boots? Lucky for you, we have a dedicated (and exclusive) team of women’s and mens Stylists waiting to answer your pressing (or every day) fashion questions. 4. WE’RE EXCLUSIVE, BUT NOT IN A BAD WAY! Carrying exclusive brands—developed in-house using your feedback—means you’re unlikely to show up wearing the same thing as someone else. Our super-smart data science team (we have over 40 PhD holders) shares interesting industry insights on their blog, Multi-Threaded. Seriously, some of our data scientists were neuroscientists and rocket scientists in their past life. Twitter is the best place to find quick, “I had no idea!” tips & tricks. Like, how often to wash hosiery or how to get powder makeup off your lapel. They’re exclusive to our @StitchFix Twitter account, so follow us for all our Stylists’ great advice. From the far-off reaches of Alaska and the plains of Missouri to the bustling streets of New York, if you need a Fix, we’ll get it there. Thought that Stitch Fix was just for ladies? For all the guys out there who stood patiently by (with a serious case of FOMO) as you opened your Fix—now it’s their turn. Now your husbands, boyfriends, best friends, brothers and fathers can get a personalized Fix delivered straight to their door! The best job ever? Scouting trends in far off places (like London & Seoul) to ensure we’re always in the (fashion) know. Our trend team is hip to industry happenings so we can bring the latest & greatest to your doorstep. We love reading your Fix Notes. Seriously. Who doesn’t love a great pen pal, right? Feel free to tell your Stylist anything—like when you’re stoked to be on a fitness kick, that you’re pregnant (surprise, we carry cute maternity clothing!) or you’re going through a breakup. We absolutely, 100% care. Did we surprise you? Tell us in the comments!